A summer course, Natural History of the Chihuahuan Desert, was offered for teachers by the Department of Biological Sciences, University of Texas at El Paso (UTEP), in the summer of 2006. Inasmuch as it provides an introduction to the desert with little background knowledge necessary, it seems appropriate to offer it on the Chihuahuan Desert pages of the Centennial Museum. It may be utilized as a self-taught course or an organized course. It will work best if there is access to the desert itself, but we have tried to supply sufficient images and links to other sources to give a feel for this desert no matter where one is located. The course as taught included a number of hours learning desert plants on the campus of UTEP and, especially, in the Chihuahuan Desert Gardens. Many of the subjects introduced here were expanded upon in class, so this should be considered as a skeleton to be fleshed out with further study. There are numerous facets to any region, and the shortness of a 4-week summer session and limitations of any one instructor insures that many facets will go unpolished. Probably the most critical shortcoming is the superficial consideration of invertebrates, but many other areas are likewise given but a lick and a promise. Natural History has various meanings, but at one time included the study of what we often think of as Nature: animals and plants and their place in the physical world. This is pretty much the sense that we are using the term here: to look at the natural world of the Chihuahuan Desert. A northern Chihuahuan Desert view. The location is south-central New Mexico and the view is approximately north. 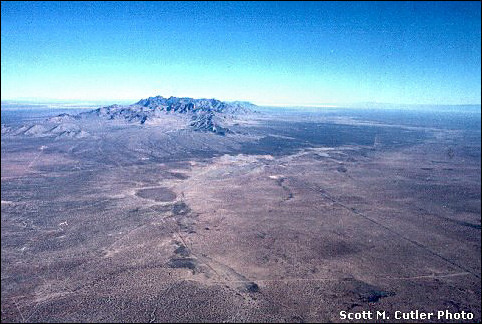 The Organ Mountains are just to the left of center, and the Sacramento Mountains can be seen on the distant right. The Hueco Bolsón is in the foreground, just north of El Paso, Texas. The general approach of these pages is to first look at what characterizes deserts in general: the definitions and types of deserts, their characteristics, where they occur, why they are deserts. After this overview, we'll go on to look at where the Chihuahuan Desert fits into the picture: its various definitions, its physical characteristics, why it is a desert, its internal variability, its geographic and climatic boundaries, etc. We'll then review a bit on biological classification and related subjects to make sure everyone is up to snuff before we begin to look at the Chihuahuan Desert biota [words in green are links to the glossary]. To survive in an arid region, organisms must either find habitats where aridity is not a problem or must have adaptations that allow them to withstand low levels of moisture. Thus we'll spend a little time looking at habitats and microhabitats within the desert region that allow organisms to avoid water-deficient conditions. Since animals are in large part dependent upon vegetation, we'll start with plants and consider ways that these taxa have adapted to aridity. Following this, we'll look at some of the major plants and plant groups of the Chihuahuan Desert. Once we have a reasonable understanding of desert vegetation, we'll look at some of the prominent and/or interesting invertebrates and then go on to study the groups of vertebrates represented in the region. Much material will be presented through links to sites on the internet. Hopefully, such links will add up to a database of Chihuahuan Desert resources that can be easily accessed for reference and teaching.